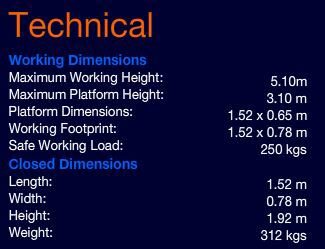 Highest quality power tower hire £121.00+VAT per week. And all these restrictions have been worthwhile. Rules and regulations have meant a marked decrease in serious injuries and fatalities on construction sites partly due to strict safety policies but also because of improved equipment which is easy to use and routinely well-maintained. Our experts can even give you advice on the best equipment so you don’t face the possibility of receiving equipment that is not man enough for the job. There is such a wide range of power towers available today, you are bound to find the right bit of kit regardless of the job in hand. 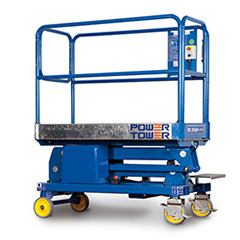 Our Power tower stock comes with plenty of additional safety features, including emergency cut-out switches, guard rails and safety rails. All the power towers adhere to the latest health and safety regulations and arrive on site pressure washed and ready to get to work. 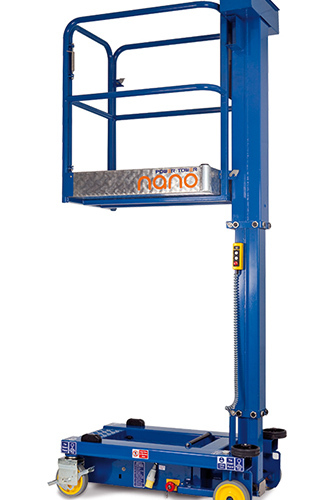 Many power towers are lightweight and manoeuvrable offering you flexibility so you can adjust your position as you go along. They can be operated by just one person using a simple touch button mechanism. In many cases you will never face extra charges for lost parts. Most power towers come as one unit, the battery and charger are included and each holds a full day’s charge – so there will be no down time wasted on site charging it up. Power towers take the headache out of working at height – no matter what the job is or how difficult it is to reach there will be a power tower available for hire that is perfectly suited for that particular task. Call us today and we can help you secure the very best equipment for the job in hand. 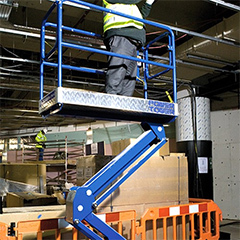 Forget the fear of perching on an unstable ladder or having to spend ages assembling and dismantling a scaffold tower, these brilliant, versatile manually powered low level platforms will keep you safe while saving you plenty of time and money. All you need to do is give us a call and we will make sure you have your power tower first thing tomorrow checked, maintained and ready for action. Prices quoted here for power tower hire do not include vat and transport. Next day delivery if ordered before 4pm.